Indian Academy of Neurology is the main national body for neurologists in India. The membership comprises of neurologists and allied specialists like neuropathologists, electrophysiologists and neuroradiologists. The academy promotes neurosciences in India and conducts various teaching courses and conferences. Subsections of the academy are dedicated to more focussed areas like stroke, epilepsy, headache, demyelinating disorders, neuromuscular disorders, to name a few. Academy also provides scholarships and assistance to young and upcoming students of neurology. 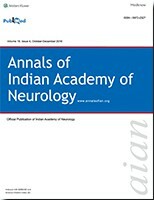 Annals of Indian academy of neurology is the official journal of Indian Academy of Neurology as founded soon after the formation of the Indian Academy of Neurology. This single official journal of the Indian Academy of Neurology forms a forum for neuroscientists to write about their research and provides educational materials and contemporary reviews on various subjects in neurology. The journal has a clinical foundation and has been utilized most by clinical neurologists for improving the practice of neurology. While the focus is on neurology in India, the journal publishes manuscripts of high value from all parts of the world. Journal publishes reviews of various types, original articles, short communications, interesting images and case reports. The journal respects the scientific submission of its authors and believes in following an expeditious double-blind peer review process and endeavors to complete the review process within scheduled time frame. A significant effort from the author and the journal perhaps enables to strike an equilibrium to meet the professional expectations of the peers in the world of scientific publication. AIAN believes in safeguarding the privacy rights of human subjects. In order to comply with it, the journal instructs all authors when uploading the manuscript to also add the ethical clearance (human/animals)/ informed consent of subject in the manuscript. This applies to the study/case report that involves animal/human subjects/human specimens e.g. extracted tooth part/soft tissue for biopsy/in vitro analysis.